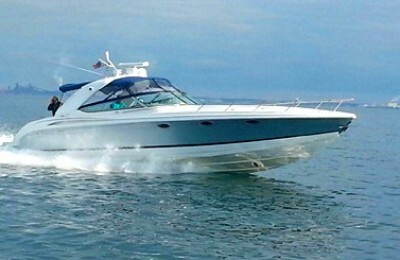 Welcome aboard and enjoy the romantic Catalina Island on this 44′ comfortable and fast power catamaran with flybridge. This 44′ French-built lagoon catamaran motor yacht is a perfect combination of luxurious motor yacht along with the extremely wide space only available in a catamaran yacht. This is a dream yacht for any type of yacht fan. Ultra spacious layout and a very entertaining fly bridge make the yacht quite special. This yacht will provide a truly memorable yachting experience. Four sections of entertainment area in one yacht. You will have an over-sized partially covered fly bridge. You can enjoy a high vantage from the upper deck fly bridge from which to over look Santa Monica bay. The main level’s rear dinning area can be fully enclosed if the weather turns and becomes chilly or windy. The front deck’s open lounge offers another cozy place for cocktail & snacks. The main salon provides a fully air conditioned dinning area if you ever need that. Thanks to the semi plane twin hulls design, the yacht is extremely stable and steady at cruising speed. Air conditioned interior & fully covered rear lounge ensure a comfortable journey regardless of hot or cold weather. There are 3 cabins and 4 baths on this yacht. The rear master bed room is a comfortable with a KING SIZE bed,and 2 queen size cabins are located in the front section of the yacht. This is a great choice for a family to spend a few nights on Catalina Island. The yacht was built in 2008 and it has been professionally maintained & cared. We hope that you will enjoy this very special yacht. Come back around 4:00 – 5:00 pm ( Depends length of day light ), 6:00 – 7:00 pm arrive at marina del rey. There are various of anchorage & moorings throughout the island for over night use, please inquire us if you are interested with multiple days private yacht trip on the island. Yacht rental, fuel, tax, captain salary are all included.Tips to crew, water taxi between boat and shore,island mooring fee are excluded. Catalina island water taxi fee is $4 per person per trip, mooring cost is around $80 per night. A 44′ Lagoon Catamaran motor yacht in excellent condition, come with 3 state rooms and 4 restrooms, fully air conditioning cabin, steady cruising experience. 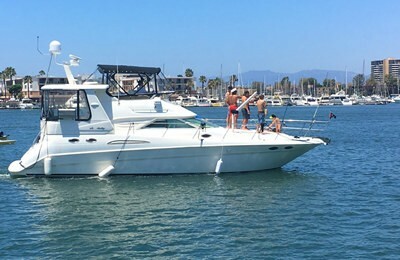 Departs at 9:00 am and return to Marina del Rey around 6:00 pm – 7:00 pm before dark. 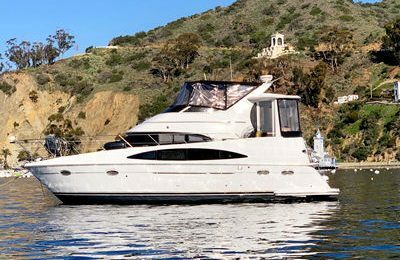 Approximately 90 miles private yacht charter trip from Marina del Rey to Catalina Island. Itineraries can easily be customized for multi-day island stay. Our captain is happy to discuss with you on all possible options.